One thing is important to remember if you are planning to buy a horse. Your time will never be your own again. There is always something to do when you own a horse whether it is riding or mucking out, waiting for the vet or simply spending time with your friend so your partnership gets stronger. If you are a family with horses, these demands increase – especially if your children are too young to make sure grooming and mucking out is all done properly as you will end up doing theirs as well as your own – at least until they are old enough to take responsibility for it as well. The children will probably also need to be taken places, such as Pony Club, riding lessons and competitions. These time constraints are just one reason why you should never enter into horse ownership lightly and always consider the ramifications before you decide to purchase a horse. Of course, the main reason you will buy a horse of your own is to ride it and enjoy spending time with it. But riding and enjoying a horse also takes time. It is not the same as going out for a run – pull on your trainers and off you go, Even if you have your horse fully liveried and you know he will be ready and waiting when you get to the yard for a ride, it is still a time consuming hobby. For example, you will want to spend time with the horse off his back so he remembers who you are as well as he remembers the person who feeds him and grooms him. Plus, by the time you have changed yourself into riding gear, saddled up and hacked out, you will have spent the best part of an evening riding because no-one wants to go to all the trouble of that for a five minute ride. Even just building up a relationship with the horse takes time, little things such as popping into give him treats will take time – especially if the yard is far away from your house. The horse is always there – so there are no days off. Assuming you do not have the horse fully liveried, there is a lot more to do than just riding the horse. There is a multitude of other tasks, many of which need doing every day or at least every time you ride. Grooming and mucking out are the main two, and these really must be done every day. 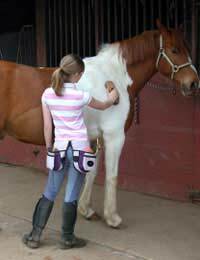 Both tasks are important for the health and hygiene of the horse and cannot be skipped or your horse will suffer. But, on the positive side, when they are done properly, your horse will love you for them. He needs loving care, and when you are the one to give it to him, the rewards are great. These are just the regular as clockwork tasks but you must remember there are plenty of other things which will make demands on your time. These include competitions and driving to them – it all takes time. In addition, your horse will need regular visits from the vet so you will need to wait for him – and not only when the horse gets sick. The farrier will also need to see the horse every six to eight weeks – and again, this can involve sitting around waiting for him to finish. And remember, when you go on holiday, you will need to make sure there is someone available to do all of this for you. You can expect to spend a lot of time with your horse. But fear not, for you will be repaid over and over in the pleasure you get from your horse. It is well worth the time and effort because the more you put in, the more you will get out.